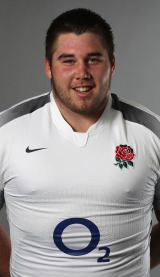 Bulldozing England Saxons prop Kieran Brookes originally lined up for Ireland in age grade rugby. Although he was born in England, he represented Ireland at Under-18 through to Under-20 level before committing himself to the country of his birth. Brookes signed for Newcastle Falcons from Fylde in 2009, after an impressive season with the Lancashire side. Brookes' stock rose in the 2010-11 season which culminated in him being named in the Saxons' Churchill Cup squad where he made his first appearance coming off the bench against the USA at Franklin's Gardens. Brookes announced in June 2011 that he will join Leicester Tigers for the 2011-12 season.